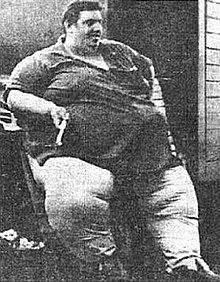 Jon Brower Minnoch (September 30, 1941 – September 10, 1983) was an American man who, at his peak weight, was the heaviest human being ever recorded, weighing approximately 1,400 lb (635 kilograms; 100 stone). This figure was only a close estimation because his extreme size, declining health, and lack of mobility prevented use of a scale. At the age of 12, Minnoch weighed 294 lb (133 kilograms; 21.0 stone), and by age 22 he was 6 ft 1 in (185 cm) in height and weighed 500 lb (230 kilograms; 36 stone). Minnoch's weight continued to increase steadily until his hospitalization in March 1978 at age 36 due to cardiac and respiratory failure. That same year, he broke a record for the greatest difference in weight between a married couple when he married his 110-lb (50 kg) wife Jeannette and later fathered two children. Minnoch was diagnosed with massive generalized edema, a condition in which the body accumulates excess extracellular fluid. Upon his hospital admission, it was estimated by endocrinologist Dr. Robert Schwartz that over 900 lbs (408 kg) of his overall body mass was retained fluid. Transportation for Minnoch was extremely difficult. It took over a dozen firemen and rescue personnel and a specially modified stretcher to transport him to University of Washington Medical Center in Seattle. There, he was placed on two beds pushed together, and it took 13 people to simply roll him over for linen changes. He was discharged from the hospital after 16 months on a strict diet of 1,200 kcal (5,000 kJ) per day. He weighed 476 lb (216 kg; 34 st), having lost approximately 924 lb (419 kg; 66 st), the largest human weight loss ever documented. However, he was readmitted to the hospital just over a year later in October 1981, after his weight increased to 952 lb (432 kg; 68 st). With his underlying condition of edema being incurable and difficult to treat, the decision was made to discontinue treatment, and he died 23 months later on September 10, 1983, aged 41. At the time of his death, he weighed 798 lb (362 kg; 57 st) with a Body Mass Index of 105.3. ^ "Jon Brower Minnoch - Heaviest Man in History". 2il.org. Retrieved 6 March 2015. ^ a b "Heaviest man". guinnessworldrecords.com. Guinness World Records. Retrieved 8 September 2014. ^ "5 heaviest people in the history". BlindLoop. Archived from the original on 27 November 2009. Retrieved 6 March 2015. ^ a b c d e "Human Body/Extreme Bodies/Heaviest Man". Guinness World Records. Archived from the original on 2006-09-03. Retrieved 2008-10-28. ^ "Human Body/Extreme Bodies/Greatest Weight Loss". Guinness World Records. Archived from the original on 2006-09-01. Retrieved 2008-10-28.